"Can you tell me what this mushroom is?" On a somewhat regular basis, we receive correspondence and photographs from foragers who are seeking our assistance in identifying a mushroom. Frankly, this is not our area of expertise, and we’re always reluctant to offer an opinion. We respond to their e-mail, noting that for several reasons, not least of which is liability concerns, we are not able to identify mushrooms based on pictures and descriptions sent to us over the Internet, and hope that they will understand. We sincerely don't mean to come across as harsh or unhelpful or insensitive. Gathering wild mushrooms for the pot is a wonderful and rewarding hobby, but it needs to be approached responsibly. Picking wild mushrooms and choosing to consume them requires a significant amount of work and study, and it also requires a firm commitment to not take shortcuts. 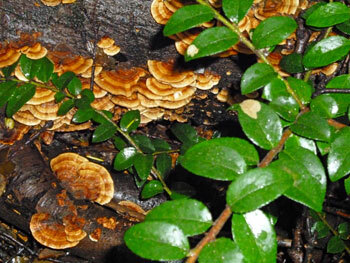 We typically suggest that individuals who are seeking help with identification locate a mycological society close to where they live, and suggest that they get acquainted with the members and become active in the group. These mycological societies are a wonderful resource...and they're great fun, offering opportunities such as classes, field trips, monthly meetings with excellent and informative speakers, etc. with the opportunity for camaraderie with like-minded individuals. From the video of National Geographic to the wireless bands of National Public Radio, the postage stamps detailed by Brian Luther in the December PSMS Newsletter, and the photographs of the gifted Taylor Lockwood (see selection below), all the world seems abuzz with bioluminescent fungi, i.e. fungi which are capable of producing light through a chemical reaction. We felt it might be time to tantalize you with some information we've heard being bantered about. Bioluminescent fungi have been discovered around the world, in countries ranging from Brazil, Dominican Republic, and Jamaica to Japan, Malaysia and Madagascar. The majority of these are from the Mycena family of about 500 species worldwide. Only 71 species of fungi are believed to be bioluminescent, out of the 100,000 known species. We all love a good story! We all love a good story, especially when it features mushrooms and mushroomers! 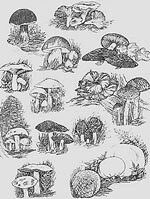 So we were delighted to discover the website, Oregon Mushroom Stories, which is composed of facts and factoids, some serious material and some clearly meant to be entertaining. Unfortunately, it appears that the website may have fallen into neglect or been abandoned - the last posting that we could find was dated late in 2013. Nonetheless, much of the material at the website is timeless, and we believe that you'll find it an exceptionally good read! Here's hoping that the creative team that helped Oregon Mushroom Stories to fruit in 2011 will soon be inspired to rejuvenate the project! It's rare that our recipe contest judges have such a difficult time selecting the winning submission. 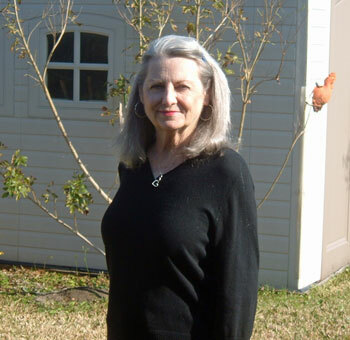 Silvia Hendricks' "Fabulous Champagne and Duxelles Tilapia" caused such a dilemma for us! Her entry is a rarity, and the judges unanimously decided to name her as the 2015 runner-up. We've awarded her one of our lovely Port Orford cedar planks as a prize. What made Silvia's recipe so special for the judges? First, it's quick and easy to prepare. Second, it's convenient - it can be prepared hours in advance of serving and held in the refrigerator at the convenience of the cook. Third, it's easy on the pocketbook, calling for tilapia, an inexpensive, farm-raised fish that's readily available. And last - and always important! - it was yummy!